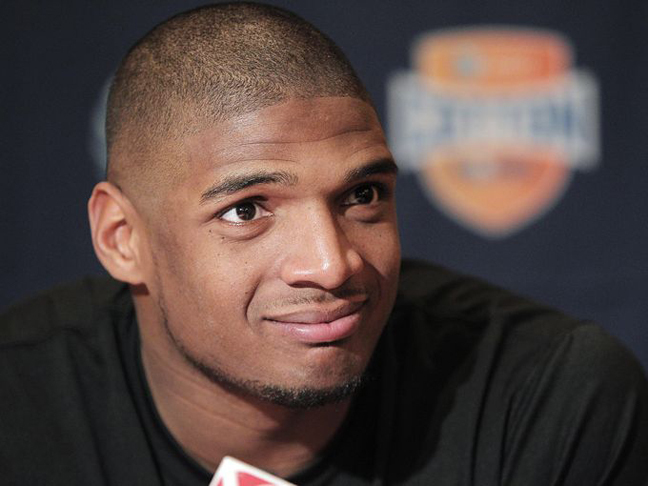 Missouri All-American Michael Sam says he is gay, and the defensive end could become the first openly homosexual player in the NFL. In interviews with ESPN, The New York Times and Outsports that were published Sunday, Sam said he came out to all his teammates and coaches at Missouri in August. “I am an openly, proud gay man,” he said. Sam will participate in the NFL combine later this month in Indianapolis and is currently projected to be a mid-round draft pick in May. “It’s a big deal. No one has done this before. And it’s kind of a nervous process, but I know what I want to be ... I want to be a football player in the NFL,” he told ESPN. The 6-foot-2, 255-pound Sam participated in the Senior Bowl in Mobile, Ala., last month after leading the Southeastern Conference in sacks (11.5) and tackles for loss (19). He was the SEC defensive player of the year. There have been a few NFL players who have come out after their playing days, including Kwame Harris and Dave Kopay. Last year, NBA player Jason Collins announced he was gay after the season. Collins, a 35-year-old backup center, was a free agent when he came out and has not signed with a new team this season. MLS star and U.S. national team player Robbie Rogers also came out a year ago. “His courage will inspire millions to live their truth,” Rogers tweeted about Sam. Division III Willamette kicker Conner Mertens, a redshirt freshman, said last month he was bisexual. Sam’s announcement comes at a time gay rights issues and sports have collided at the Olympics in Sochi. Russia's anti-gay law has received much attention, and criticism, because of the games. Coaches, General Managers and others responsible for interviewing and hiring draft-eligible players and free agents must not seek information concerning or make personnel decisions based on a player’s sexual orientation. This includes asking questions during an interview that suggest that the player’s sexual orientation will be a factor in the decision to draft or sign him. Examples: Do you like women or men? How well do you do with the ladies? Do you have a girlfriend? Sam said many people at the Senior Bowl, an all-star game for NFL prospects, seemed to know he was gay. Sam told the Times he dated a man on the Missouri swim team and came out to teammates L’Damian Washington and Marvin Foster about a year ago, before letting the whole team know during last preseason. Missouri coach Gary Pinkel said in a statement Sunday night he was proud of Sam and how he represented the program. Missouri linebacker Donovan Bonner was a teammate of Sam's for five years. “We knew of his status for 5 years and not one team member, coach, or staff member said anything says a lot about our family atmosphere,” Bonner tweeted. AP Sports Writer Steve Reed in Charlotte, N.C., contributed to this report.